It all started when Sota’s grandfather fell ill and nearly died. Sota and his family prayed to God to heal Grandfather after the stroke, and Grandfather lived. But he had a lot of trouble learning how to talk again. When he tried to talk, the words were slurred and came out very slowly. It was hard to understand what he was saying. Grandmother came up with a bright idea. She told Grandfather that he should memorize the memory verse for adults every Sabbath. But Grandfather was stubborn. 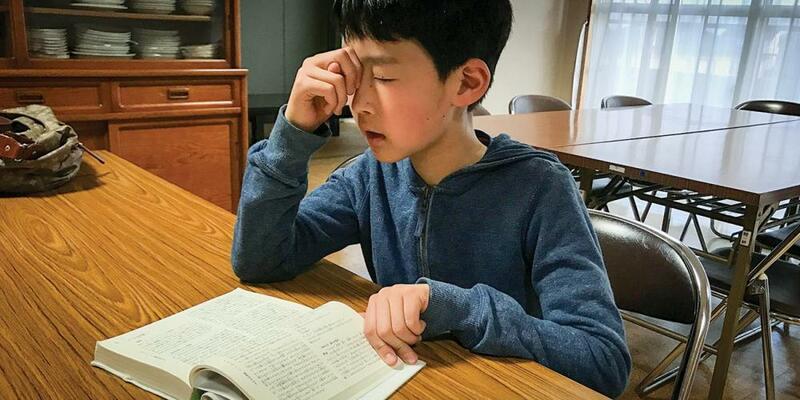 He didn’t want to memorize because it was difficult. Grandmother wrote down the memory verse on a piece of paper, and Sota took it home. Early Sabbath morning, Grandmother asked Sota whether he knew the memory verse. Sota recited the memory verse to her perfectly. Grandmother was so pleased! Then she recited the memory verse to Sota. She had memorized it, too! Grandmother invited Sota to go to the adults’ Sabbath School with her and Grandfather. When Sabbath School began, the teacher asked who knew the memory verse. Sota raised his hand, and the teacher gave him the microphone. All the adults were surprised to hear him say the memory verse. Sota’s grandfather also was surprised, but he didn’t say anything. The next week, Sota memorized another memory verse. In Sabbath School, the teacher again asked who knew the memory verse, and Sota again raised his hand. But he wasn’t the only person to raise his hand. Grandfather raised his hand, too! Grandfather had been so amazed that Sota knew the adult memory verse that he had memorized it, too. The same thing happened the next Sabbath and the Sabbath after that. Both Sota and Grandfather recited the memory verse in Sabbath School. As Grandfather memorized the memory verses, it became easier for him to speak, and his speech improved. Grandfather still doesn’t talk very much. He has never said what he thinks about Sota’s decision to memorize the verses. But Grandmother is very happy—and so is everybody at church! All the adults love to hear Sota recite the memory verse every Sabbath. Everyone also is happy that Grandfather is speaking better now. And that’s why Sota likes memorizing the Bible more than playing his favorite games of tug-of-war and badminton. He likes to memorize the Bible because it helps his grandfather. When we help someone, we are loving that person—and showing our love for God. How can we help others? One way is to give to the mission offering so others can learn about God.